Throughout life there are people that cross your path and make an invaluable impact on you. For me, Steve Nobel is one of these people. An industry expert, a wealth of knowledge and the one who has single handedly made the biggest impact on my business. Thank you @nobelinks. I'm forever grateful! Most business models conceived fifty years ago are ill-suited for meeting the challenges of todays dynamic markets. Residential interior design is similarly challenged. Wishful thinking that consumer demand can continue to be channeled through a labyrinth of conventions ‘to the trade’, in an era when consumers are in control and unwilling to abide by most consumption orthodoxy, is perilous to industry incumbents and restrictive to consumer choice. Some ask, “are we about to be Uber-ed?” shocked like so many others in the transportation industry. The trade resources, distribution channels and media that make up the system of interior furnishings (the design ecosystem) understand the challenge and are beginning to transform a defensive posture in favor of a ‘eyes wide open’ offensive and strategic approach to the future. That value system depends on each of the subsystems to perform at its best. Just like the ecological health of a natural system, the health and vitality of the design ecosystem depends on the health and vitality of each valuable contributor to designers’ most resourceful clients. A synchronous alignment of supply and demand. But let’s not get ahead of ourselves. Actually, tomorrow’s client resembles in many important ways today’s client. Boldly empowered by technology, they are seizing control of the conventional decorum for decorating and going rogue. Beyond the 1 in 5 affluent households that play by the rules, this corps of discovery is agile on line, flirts with digital enablers and recreates by DIY. They have pulled back the veil on the mystique surrounding decoration, mistrust those who hide behind it and presume the fix is in for intruders. With the genie out of the bottle, though, they circumvent the conventions ‘to the trade’ and deflate the value of interior design. Meet the militants on a mission at home. A designer’s next best client, however, may be one from the emerging elite aspirational class: educated and cultured HENRYs who are admittedly time constrained, lead complicated lives, prefer to spend on services rather than on material goods (those that anyone can get anyway) and whose confident self image aligns with their economic status. For them conspicuous consumption is out. Inconspicuous consumption is in. They aspire to being more rather than having more. If designers can show clients that they ‘get me,’ can ’do it for me’ and can explain ‘why its worth it,’ this client's flight to value lands at that designer’s brand. Probing empathetically into their motives and behavior, becoming advocates for customizing their individual quality of life, is our Job 1, right now. Yet to meet those expectations for luxurious client experiences, interventions are now and will be necessary to earn their trust and then their wallets, no matter how deep. To keep up with them, our pace needs to quicken. Think of all the other professions that have become commodities: investment, travel, book buying and other markets that overnight had to earn income based on the value of their advice and judgement, rather than on preserving boundaries for consumers to buy the way they wanted them to. And think of the professions that are paid for what they know (not just what they do): legal, financial planning, accounting, psychology and many others. Experiential luxury is the new standard; a higher bar than even functional benefits, emotional appeal, and craft. It’s what keeps executives awake at night, even at the most luxurious brands throughout the world. What this means for interior design is a new way of looking at interior design through the experience of the client. More than imaginative shopping, experiential luxury is the whole journey taken by clients with their designer. And every ‘touchpoint’ matters. It’s a system dependent on respect and reassurance from the initial client meeting, all the way through the ‘big reveal’ after installation, and everything that matters to the client in between. Indeed, it all matters. For experiential luxury to be luxurious, it takes a system to live up to its potential. This system of product and service providers (trade resources for the life well-lived) is really a community of entrepreneurs passionate about making, marketing, merchandising and story-telling through its media. Faced with recession in 2010, some of its leaders shook hands, reorganized as DFA and agreed that “we are all in this together,” setting out to inspire and engage with these most resourceful consumers by enfranchising the trade and marketing the value of interior design. This year, DFA’s DoItFor campaign staked that claim by promoting the value of design in language tuned to consumers; it imposed upon itself the responsibility to lead the way. As of this writing, doitfor.com is about to launch on digital and social media an emotional invitation to consumers to “do it for” … themselves, their friends and families and especially their homes as the background for their lives. But a consumer-friendly invitation needs shared responsibility by the design ecosystem to perform up to high expectations. And to meet those expectations, each ‘touchpoint’ along the client’s journey within the system needs further review and even some re-engineering. That system in 2020 could be the industry’s strongest competitive advantage. Contact me for your homework assignment, with a smile. Professional fees for professional services (both fixed and hourly) continue to trend upward in designers’ search for the pricing model that outperforms profits from procurement. In a survey conducted by my firm, designers reported that today, pricing models are a mix of revenue sources. Tomorrow, they say, that mix will be heavily weighted toward fees. Clearly, there is no one pricing model that is always profitable for all designers. But many designers have increased or are increasing their income through higher hourly rates and fixed or variable design fees. In my view, they are earning what they deserve from design, not procurement. Consequently, their reliance on income from sales margin is declining. Once again, there is no single formula or income mix that serves everyone’s circumstances. But respondents to the survey now have a clear way to think about what works and how it works for their profit picture. What if your income was earned the new way? Numbers talk. Our next survey on marketing is coming up. Posted on Friday, March 13, 2015. After Stephen Nobel’s presentation for ADAC, interior designers left equipped with tools to better market and grow their business. Hosted by Dan Cahoon, the president of Jerry Pair as well as president of the DFA, the presentation keyed in on strategies for moving on from a plateau of success, touching on leadership, business management and maintaining relationships as a proactive part of gaining new clients. Nobel’s presentation was informed by not only personal experience but also by a survey conducted by the DFA where individuals responded to questions about why they chose to use interior designers. Questions ranged from specifics about the process to why clients chose to use an interior designerIt asked clients what they got out of the decision to hite a designer and how they found their interior designer. Nobel said designers need to act like they “are the CEO,” meaning, that in their business, they implement a vision that others cannot necessarily see despite the minutiae and conflicts that might get in the way. Good project management, and internal leadership that encourages all parts of the process to feel invested in the larger outcome, also builds a more attractive business for both clients and employees. Next comes implementing a plan as to accomplish their long-term goals, keeping their associates in mind, as well as defining what the business itself is in terms of pricing, implementation and the types of projects and clients taken on. The mistake commonly made by those without a clear vision is designating too much time to attempting to fix small problems. Though it may seem counterproductive, the more effective method is to stop and take stock of the big picture. Thus, designers should remember and internalize that as a luxury brand, something “demonstrably superior and pleasingly different that all the others available.” By being extremely selective about how they are utilized by others as a luxury brand and internalizing this philosophy in terms of their web presence and client relations, the designer’s efforts can yield the highest rewards. Nobel warned against “flowery, abstract conceptual language” as it “doesn’t mean much to anyone except your copy writer.” Figuring out how deliveries, invoices and proposals are handled, how designers “realize creatively the clients’ visions for the future in their lives” and how designers decide what they will and won’t take on in terms of jobs or clients are all important to identifying a designer’s service as a luxury brand. Images courtesy of Stephen Nobel. More than the access to products and the overall service provided, it is the process of working with a designer that surveyed clients identified as a reason to hire an interior designer. It is that distinction that makes or breaks a luxury business. Also important was the perception by clients over whether the designer understood their tastes, if the end result would reflect the client or the designer, if the designer would be respectful of time and money and if the end of the project will yield a custom result and experience. Nobel identified “touchpoints” for before, during and after a project, where designers could evaluate the client experience provided, such as ensuring that phone and email contact is timely, tasteful and polite, what the planning process and installation are like, and how they interact and keep in touch with the client at the end of the project so that the next client is the result of strategic direction instead of chance, as “the shortest distance between the current best customer and the next best customer is through one or the other.” This last point is one of the most important things that designers can do for themselves and the industry as a whole. 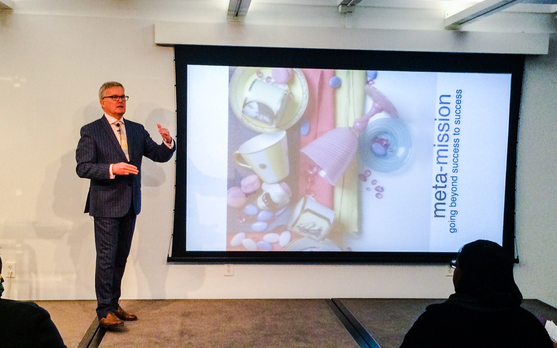 He encouraged design centers, showrooms and designers to remember that they “are all in this together,” and that a cohesive presentation, where designers treat showrooms as an extension of their studios, and showrooms become more personable and attentive to the needs of clients brought in by designers, will result in a better future for the industry. Interior designers filled the conference center at ADAC last week for a presentation by Steve Nobel on “Meta-Marketing: going beyond what is to achieving what could be.” His remarks explore every dimension of designers' success, including ways to build creative confidence, improve each client’s experience with design, the digital marketplace, price competitiveness and particularly the loyalty necessary to make the showroom marketplace viable and sustainable. Jo Rabaut, Principal at Rabaut Design Associates and Director at Large for ASID added, “I always look forward to Steve's programs, he is extremely knowledgeable, has great vision and tons of wisdom for designers. I am thrilled that ADAC continues to bring him in to speak and that ASID has partnered with him on his many CEU's and seminars. Thanks to all the designers who joined us on our speaking tour on "Contracts and Fees"
An audience of over 200 designers at Atlanta Decorative Arts Center (ADAC) listened intently to Steve Nobel and Alan Siegel, two of the nation's leading experts on the business of design, as they co-presented an interactive session on "Contracts and Fees" that encouraged designers to earn and protect the profits they deserve. "We could have listed to them all-day,' said Beth McMillan of McMillan Interiors. "Their expertise and means of delivery are pitch-perfect. They shared their knowledge with such insight into what we are facing in this changing market, and the do it with respect and empathy. We plan to bring them back for more." Matt Hare, host for a luncheon following the presentation and regional representative for Kravet, Lee Jofa and Brunschwig & FIls noted that over the years, "we have demonstrated our support for the design community by bringing Steve and others to our showrooms and ADAC. They bring a national perspective on business trends that inspires our customers and enables them to continually advance their . These programs make a difference"
Steve and Alan established the real value that designers provide their clients; that the experience of working with them from beginning to end is worth a premium. They showed examples of how to calculate fee-based compensation models and how to develop 'user-friendly' agreements with their clients that explain in advance what the design experience is likely to entail, roles and responsibilities for designer as well as client and other terms and conditions that protect designers' profit. 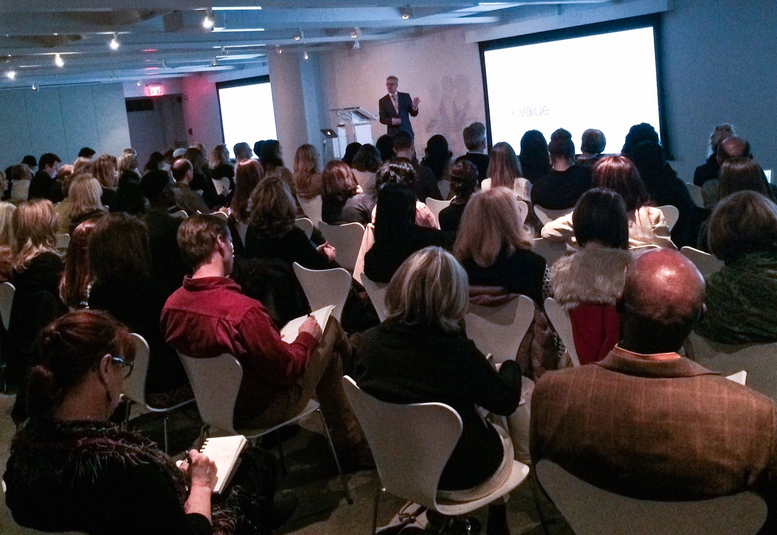 "Hug Your Client: Rediscovering the Art and Science of Delighting Clients and Keeping Them Coming Back for More"
There were over 200 interior designers in attendance with a reception sponsored by Kravet Inc.